Hawick prop Rory Sutherland has been drafted into the Scotland squad for Rugby World Cup 2015 as an injury replacement for Ryan Grant. Grant sustained a hamstring injury in training earlier this week and, with the recovery period expected to extend beyond the competition, has been replaced by the 23-year-old Borderer. Sutherland – who was set to start for his club against Ulster in the Guinness PRO12 last night – instead flew to London to link up with the Scotland team ahead of this Sunday’s Rugby World Cup Quarter-Final against Australia at Twickenham (kick-off 4pm) – live on ITV. 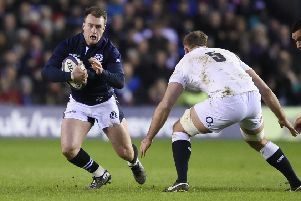 After a meteoric rise through the ranks, standout performances in the starting XV and inclusion as 24th man in the 2015 RBS 6 Nations’ squad, Sutherland earned a full professional contract with Edinburgh Rugby during the summer, keeping him with the club until at least May 2017. The former Trinity Primary and Hawick High School pupil came through the ranks with his hometown club and school sides before representing the Borders and Scotland at under-17 and under-18 in the back-row. He switched to loosehead prop during his first season of senior rugby at Hawick RFC and, after a season with Biggar, caught the attention of RBS Premiership runners-up and Border League winners Gala RFC. Under the tutelage of head coach George Graham, the dynamic 23-year-old has been a mainstay in one of the most imposing packs of the country’s top domestic division, and subsequently earned selection for Scotland Club XV earlier this year. He scored his first try for Edinburgh against London Welsh in the home European Cup fixture in December 2014.